Storing credit cards on your phone is safer, experts say, than in your wallet, which can be lost or stolen. Most of us grew up writing checks to make purchases, which can be a laborious task when you’re standing at the checkout counter writing in longhand (and then noting the transaction in the checkbook), and feel especially stressed if there’s a long line behind you. When debit and credit cards replaced the checkbook for most retail transactions, it was a welcome and efficient step. But a new technology could make using debit and credit cards as antiquated as a checkbook. Mobile wallets or payments, as they are known, let you tap or wave your smartphone at a credit card terminal to make a purchase at your favorite store or restaurant. You start by loading your credit and debit card accounts onto your phone, so they are stored on your phone instead of in your wallet. At the checkout counter, you verify your identity with either a fingerprint or pass code, choose the credit card you want to use and waltz out of the store with your purchase. Amazingly, this new technology—in the form of Apple Pay, Android Pay or Samsung Pay—is touted as being more secure than physical credit or debit cards. 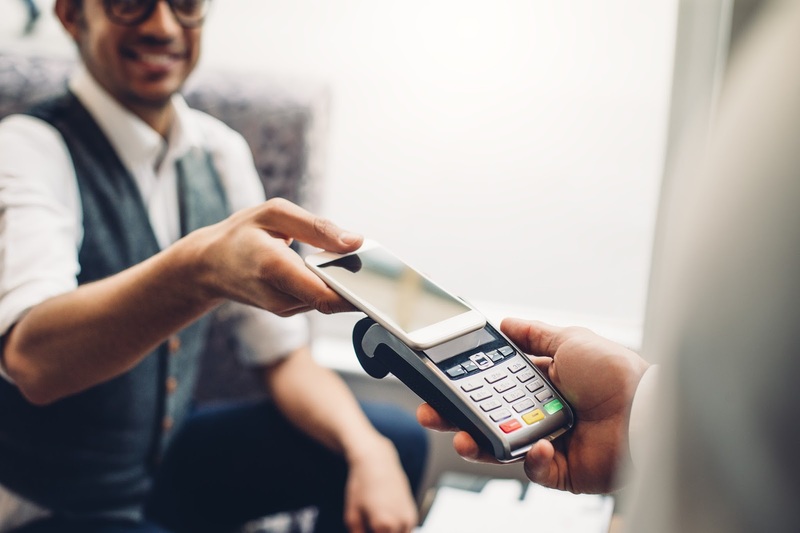 Transactions use near-field communication (NFC) wireless connectivity, and the connection’s short range makes the transaction an unlikely target for hackers. On top of that, mobile payments have several security layers that make this option far safer than using a traditional credit or debit card that can be stolen or the information swiped by a store clerk or waiter. A forerunner of the mobile-payment trend is Starbucks. Its mobile app lets you load money onto a Starbucks digital gift card, pay for items with your smartphone and accumulate rewards for free food or drinks. You can even use the app to order your mocha latte before you get to the store, so it’s ready when you arrive. Not all merchants are set up to accept mobile payments, so check first to make sure. Your phone must also have an NFC chip, so your older phone may not be able to make mobile payments. One of the earlier and influential movers in the field of mobile wallets, Apple Pay can be used on iPhones, iPads and Apple Watches. To make a purchase, hold your Apple device near the reader with your finger on the Touch ID. Or, double-click the Home button when your device is locked to access Wallet. Your card number is never stored on your device, and when you pay your debit or credit card, numbers are never sent to merchants. Apple Pay assigns a unique number to each purchase, so your payments stay private and secure. To make the transaction even more secure, if you lose your iPhone or iPad, you can put your device in Lost Mode (using the Find My iPhone app) to suspend Apple Pay, or you can wipe your device completely clean. You can also stop payments from your credit and debit cards by logging into iCloud.com. Unlike Apple Pay, Google’s version of a mobile wallet doesn’t use fingerprints to authenticate your identity, but accepts a PIN code, password or pattern. To complete a transaction, tap your phone on the payment terminal and enter your pass code. Like Apple Pay, Android Pay uses “tokenization,” which replaces your payment cards’ real numbers with alternative numbers that are used just for that transaction. So, your credit card information is secure in case of a data breach. Unlike Apple and Android Pay, you can use Samsung Pay at any checkout terminal that has a magnetic-stripe credit card reader because it’s not limited to NFC. Samsung Pay uses a technology that mimics the credit card swipe. This means you can use it almost anywhere. However, you must have service with a participating wireless carrier, including AT&T, Sprint, T-Mobile or Verizon Wireless. Like the other two options, Samsung Pay uses encrypted software to hide your card numbers. To launch the app, swipe your phone, secure the transaction with your fingerprint or enter your pin, and hover your phone over the card reader to pay. Although not a phone, PayPal lets you access your credit and bank accounts without needing to use a credit or debit card. PayPal customers can make purchases at credit card terminals using their phone number and a PIN code. Like its online transactions and like Apple, Android and Samsung Pay, in-store purchases using PayPal are tokenized and encrypted. PayPal has recently added an app for Apple, Android and Windows that lets you store loyalty cards (like those used at grocery stores) on your phone. With the new app, you can order ahead from a restaurant that partners with PayPal and pay with your phone, so when you arrive, all you need to do is pick up your pizza and get it home while it’s hot. Not all stores have signed up for the PayPal partnership, so make sure you check for participating locations on your app. “10 Ways to Pay with Your Mobile Phone,” March 31, 2016, Fueled.com. “Easier Ways to Make Payments With Smartphones,” July 30, 2014, New York Times. “New Ways to Pay With Your Phone,” February 2016, Kiplinger. “Can a phone replace your wallet? I went shopping to find out,” December 16, 2014, c/net. “Why Mobile Wallets are Safer than Physical Wallets,” July 27, 2015, Capterra . “Are mobile wallets safe?,” Feb. 24, 2016, KLS.com.